Harley Dykstra has been approached by the Shire of Capel to assist them with quantifying the deformation (downward movement) of a portion of Calinup Road in the locality Gelorup within their shire. It has been noted by users of the road that, parts of it are subsiding and the Shire is keen to remediate the problem. However, it needed to quantify the extent of the movement, in order to secure funding to repair the road. 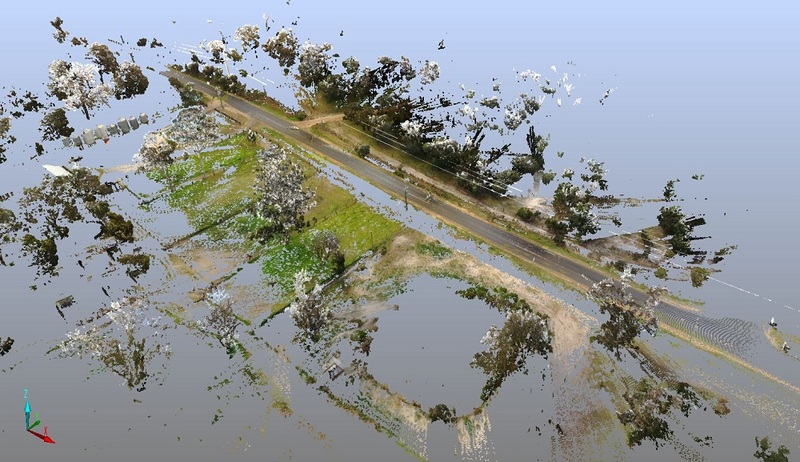 Harley Dykstra’s use of Terrestrial Laser Scanning provides a good observation platform by which the road can be accurately measured (in great detail) and movement compared across time. In the first instance, we conducted a preliminary feature survey of the road, including the bitumen formation, shoulders, batters, and services located within the road corridor (fence to fence). After this, we conducted a series of laser scans along the road’s surface in order to measure the exact height of the bitumen surface and gravel shoulders at millions of locations along the 250 metre section of the road being monitored. The sheer quantity of these measurements enables us to produce a highly accurate and easily comparable point cloud surface. This process has been repeated at monthly intervals and by comparing the data obtained during each survey we have been able to quantify the exact extent, location and nature of the road deformation. We have then output the results in a graphical format which clearly and simply shows the nature of the change in the road formation’s shape. This then provides the Shire a clear graphical presentation that they can use to make their case for road funding. Harley Dykstra has been pleased to be involved with this project and looks forward to other opportunities to provide our services to local governments in Western Australia.